For regular readers of this blog, this post adds nothing new. Think of it as placeholder – a link to send people to when they ask about this basic subject. Picture the scene, if you will. The climate science enthusiast explains that the sun heats the atmosphere and the surface of the earth – both land and sea. And everyone agrees. Of course some solar radiation is reflected and no one disputes it. The climate science enthusiast explains that the earth, when heated up by the sun, emits thermal radiation which is upward radiation (of course). And everyone agrees. The climate science enthusiast explains that the atmosphere absorbs some terrestrial radiation, heats up and emits thermal radiation in all directions – some of it downward. Many are not so sure. You are mixing up solar radiation with this ‘back-radiation’ from the atmosphere. Please provide data from night-time only. This has been a theme on many other blogs and in many comments on Science of Doom so it’s worth pulling together the basics. This equation describes the spectral intensity of a “blackbody” as a function of temperature (absolute temperature) and wavelength. The values of h, k and c0 are constants. T is absolute temperature and λ is wavelength. If we plot the result of this equation for a temperature of 5780K – the sun – we get a graph which looks remarkably like the radiation we actually measure from the sun outside the atmosphere. This is from Incropera and DeWitt – for those suspicious of everything produced by climate science, a work untouched by climate scientists – which goes by the enthralling name of Fundamentals of Heat and Mass Transfer and is now in its sixth edition. Much the same. And it gives us confidence that Max Planck was right. In which case we can calculate some key parameters about the radiation from the sun and from the earth. Solar radiation at 5780K has a few interesting properties which are easily calculated using the equation above. You can put the equation into excel and work it out for yourself. Or you can use spectralcalc.com to do the heavy lifting. With spectralcalc just select a temperature and at the bottom select an “Upper limit” and “Lower limit” of wavelength. This will calculate the spectral intensity between these two wavelengths using Planck’s equation. Don’t forget to make sure you divide this Band Radiance by the Radiance, and not the Radiant emittance (check the units to make sure you are comparing like with like). Some important results from Max and from the sun.. The last important point to consider is that sometimes people get confused about the relative magnitude of solar and terrestrial radiation – for example, with the first graph in the post the solar radiation is much higher than the terrestrial radiation. But this is because the solar radiation in that example is the value close to the surface of the sun. But the earth only receives about one two-billionth of the solar radiation due to its distance from the sun. Overall, and on average, the solar energy into the atmosphere is of a similar magnitude to the terrestrial radiation out of the atmosphere. (Otherwise the earth would heat up or cool down very quickly). But in any one location on any given day it is possible for the solar radiation to vary from zero (night-time) to potentially over 1000 W/m2 (sun overhead on a cloudless sky). The absolute maximum is the total solar irradiance of 1367 W/m2 – this would be the case if the sun was directly overhead and the atmosphere reflected or absorbed nothing, which is never the case, but let’s consider this condition to get an idea of the maximum possible solar radiation in the longwave. Well, hopefully everyone can see that even though the radiation spectrum by wavelength for any radiating body extends to infinity, the amount of solar radiation which is >4μm is 1% and the amount of terrestrial, or longwave, radiation which is <4μm is much less than 1%. This means, if we measure radiation with a wavelength of >4μm it is not from the sun, even if it is daytime (to a 96 – 99% accuracy). And if we measure radiation with a wavelength of >13μm it is not from the sun, even if it is daytime (to greater than 99.9% accuracy). That is, unless Max Planck and the sun are wrong. If you think this explanation or conclusions are wrong in any way then stay on this post and ask questions or explain what is wrong with it. Because if this basic element is confusing it will be difficult to make any progress in understanding climate science. Only one point I wanted to clarify is in the conclusion. I am no expert on mathematics but just to get my head around this are you saying that although 1% of the solar radiation is >4μm then the probability of the radiation within this category being from the sun is 1-4%? Therefore it is possibly entirely from other sources i.e. terrestrial sources and back radiation as stated in the early part of your posting? I know it sounds like a really dumb question but like I say I am no expert on mathematics so I want to get it straight in my head before I argue the point with the idiots who won’t accept the truth about climate change. You ask a good question that I should have clarified better. The proportion of solar radiation above 4um is 1%. But solar radiation at it’s peak instantaneous value (sun directly overhead) can be up to 4x the magnitude of the terrestrial radiation, so when we actually measure radiation greater than 4um, up to 4% of the measured value could be from solar radiation. So if, for example, solar radiation was 100x the magnitude of the terrestrial radiation this 1% of 4um and above would be of a similar magnitude to the terrestrial radiation and we wouldn’t easily be able to distinguish between terrestrial and solar. Yes that does clarify the basic premise of the 1% value although I still had to read it a few times to get it clear in my mind. Got it in the end. I have heard that they are due to radiative flux through the star, from the inner core through the outer layers. A blackbody, on the other hand, assumes that it absorbs all of its internal energy and re-radiates it out of the surface. Is that correct? Or are there other reasons for deviation from a blackbody? Notice the difference in approach between the climate scientist (Taylor), the physicist (Incropera), and the climate blogger. The climate scientist (who wants to increase public confidence in GW theory) picks the sun’s temperature by doing a best-fit between observation and theory. He ignores the spike in emission at about 0.5 um that is about 7% (?) higher than theory would predict. (If this spike was caused by random experimental error a best-fit would be appropriate, but the spike shows up in both graphs.) The physicist knows that no real object radiates exactly like a perfect blackbody, so he picks the sun’s surface temperature so that the highest points on the curve agree with theory. The substantially larger deviations between theory and observation occur at wavelengths where the emissivity is lower than 100%, or where gases or particles in the sun’s “outer atmosphere” absorb energy. 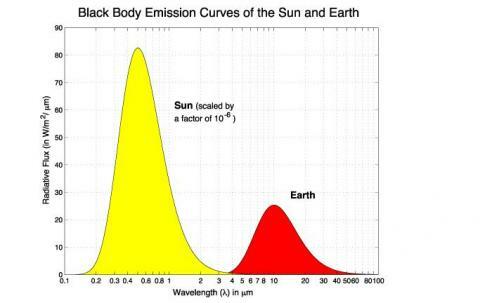 Most climate science bloggers show only the theoretical curves in yellow and red and don’t tell us what a “blackbody” really is – a hypothetical object which absorbs 100% of all wavelengths of light that strike it. Planck’s equation tells us the MAXIMUM amount of energy an object at a given temperature CAN emit. We need to know how much it absorbs at each wavelength – and possibly other factors – to calculate how much it WILL emit. With thousands of absorption lines these are difficult calculations. The dirty secret is that most components of the atmosphere – all of the nitrogen oxygen, argon, and other inert gases – do not absorb or EMIT long wavelength radiation. So the atmosphere is not a blackbody in the infrared. A simple thought experiment suggests that Planck’s Law doesn’t apply to all situations. If we allow gas molecules to expand until we have relatively few molecules in a cubic meter rather than the usual 10^20 or so molecules, the radiation in W/m^2 leaving a region is unlikely to remain constant. At some point, there simply isn’t enough kinetic energy in the molecules to support the theoretical outflow of energy. Speaking of the sun’s “outer atmosphere”, the temperature of the corona is millions of degrees. Given that total emission varies with the fourth power of temperature and that wavelength varies with the reciprocal of temperature, Planck’s law would suggest that the earth receives 10^12 times more energy at wavelengths around 0.001 um (hard UV and X-rays) than it does around 1 um. (This radiation is mostly absorbed by the thermosphere and is responsible for the relative warmth of this section of the atmosphere. However, some people think this radiation could influence cloud formation.) Unfortunately, there is so little material in the corona (and the thermosphere) that they are not in a state of thermal equilibrium – another undisclosed requirement for objects emitting blackbody radiation. Since laboratory studies on blackbody radiation are usually performed in cavities lined with solid black materials, some physicists are concerned whether Planck’s Law and related laws apply to liquids, gases, or plasmas. Scientists are having difficulty explaining the sun’s structure and behavior using these laws. (See http://www.thermalphysics.org). In an earlier post, Science of Doom did a great service by posting some experimental evidence that long-wavelength radiation returning to the earth’s surface does follow Kirchkoff’s Law. A post about coronal emission of hard UV deserves equal time. Skeptical readers of Science of Doom might be better served by ignoring oversold theories and simply looking at the observed radiation reaching the earth (1365-6 W/m^2 in the visible according to satellites; ? W/m^2 in the far UV from the sun’s corona – which needs different detectors) and at the observed radiation reaching the earth’s surface (both in clear and cloudy locations). These are facts. The facts are superficially consistent with theory, but we haven’t taken a thermometer to the sun’s surface to test that theory. What makes you think that Prof FW Taylor is trying to fit the solar spectrum into any kind of preconceived agenda? Have you read his book? I’ve taken one extract here without any accompanying text because this post is about one simple subject. From memory he touches on the solar radiation but it’s not the focus of the book. Taylor is a professor of physics at Oxford University. I’m not sure what kind of preconceived ideas you have but I recommend you read his book – only $40 from bookdepository.co.uk. You might be surprised. The legend for Taylor’s graph says that a “best-fit temperature of 5780 degK” was used to generate the theoretical curve. Given that known mechanisms (absorption, <100% emissivity) reduce the intensity of emission, isn't a best-fit to the data inferior to Incropera's "envelop fit"? For that matter, can't a temperature of 7000 degK or even 10,000 degK combined with emissivity <100% and/or absorption theoretically produce the observed distribution of intensity vs. wavelength? Does the earth receive radiation from the sun corona? Does the same simple application of Planck's Law explain the wavelength and intensity of this radiation? The internal temperature of the Sun is in the millions of degrees – the surface temperature is on the order of thousands of degrees. When the Sun is viewed from a sufficient distance such that the surface is well defined, we don’t care about the internal temperature of the Sun – just it’s surface temperature. The assumption of a black body implies the absorption of radiation is equal to its emission on the surface in question – which requires that the temperature of the surface remain constant. For the Sun, the assumption of a constant temperature surface is a reasonable assumption. However, when you attempt to estimate the temperature of planets based the Sun’s radiation, then you need to be careful since the planets are tilted on their axis, rotate and absorb and store radiation as heat and in general can’t be modeled as constant temperature surfaces. Note, the Stefan-Boltzmann law can be derived from the Carnot cycle. If you should ever falsify the second law of thermodynamics then the Stefan-Boltzmann law dies with it. I think my question was not clear. The incoming solar radiation spectrum is very close to, but not exactly equal to, the theoretical blackbody spectrum. For example, there is a very modest shift of energy from small to large wavelengths. This deviation is not very important to radiative balance of the Earth, and is therefore probably outside the scope of this blog, but I’d still be interested to know what causes it. In any case, there are no perfect blackbody radiators, even if it is difficult to find strong deviations, and I was asking what particular non-blackbody quirks were contributing to the sun’s deviations from a perfect blackbody curve. Again, just to be clear, I know this is a very small effect, as demonstrated by the plot on this page, and hardly matters to terrestrial climate. I should have checked things out on my own first! This article is a nice diversion, but when are you going to get to the meat of the issues. CO2 drives global warming because it has a positive feedback, or water vapor offsets the warming effect of the reflected long wave radiation absorption and CO2 has only minimal effect on global temperatures. Are you a man or mouse? Get to the meat of the issue. You say 2-billionths of the sun’s energy at source reaches the earth. I think the proportion should be 2-one hundred thousandths. Either way, why scale the graphic by 10^-6? The almost complete separation of the solar and terrestrial curves is at odds with the typical explanatory graphic of the phenomenon which shows nested curves, those for colder temperatures enveloped by those for warmer ones. Unlike your graphic they are also asymmetric with an extended long-wave tail. Why these differences? You are right depending on what we take as the source, so I haven’t been specific enough. If we take the total radiated solar energy then the correct value is 1 in 2-billion. Both come to the same value. If you take a set of nested curves and then divide the top one by a factor of 100,000 what do you think you will see? Will the curve that is now divided by a factor of 100,000 still be above the other curves at all points? Yes. The effective radiating temperature of the solar flux at TOA is 394K, higher than the surface’s 288 which in turn exceeds the atmosphere’s 255 or so. Curves for these three temperatures are nested (one of your posts shows two such nested, long-tailed curves). This means that the atmosphere interacts with infra-red radiation from both TOA and surface. The IPCC’s global mean energy budget confirms this. showing a quarter of incoming radiation absorbed in the atmosphere. This has the uncomfortable implication, for the AGW hypothesis, that surface warming could result from the atmosphere absorbing less incoming radiation or more of the outgoing variety, rendering the cause of global warming moot. What the satellites measure for incoming solar radiation at TOA is 1367W/m^2. When averaged over the surface of the earth this is 342 W/m^2 (=1367/4). And the measured reflected solar radiation is 103 W/m^2 (global annual average). This means that 239 W/m^2 is absorbed by the climate system. These are the measured values. Outgoing longwave radiation (OLR) measurements also get this value. Instrument error means that there is an uncertainty of around 5W/m^2. If you convert 239 W/m^2 to an effective radiating temperature it is 255K. “the amount of solar radiation which is >4μm is 1% and the amount of terrestrial, or longwave, radiation which is <4μm is much less than 1%”. Question: Given that GHGs in the atmosphere absorb only wavelengths greater than 4 microns and that, according to K&T, the atmosphere absorbs up to 26% of solar radiation, most of it presumably in the band 0.75 microns to 4 microns, which molecules in the atmosphere are responsible for the absorption? The question arose only obliquely in our original conversation in Part two. The GHGs absorb at many wavelengths between 0-4μm. Compare the top of atmosphere solar spectrum with that measured at the ground. Water vapor, ozone, CO2 are absorbers. And for the high energy ultraviolet, oxygen (O2) is an “absorber” – which is where ozone (O3) comes from. And so that is why saying the atmosphere is “transparent” to solar radiation is not quite right. “Mostly transparent” is a better description. So, GHGs are dual-purpose components of the climate system: they cool the surface by absorbing solar radiation in particular wavelengths; and they warm it by radiating to the surface at different wavelengths. Would it be correct to think that GHGs absorb higher average intensity solar radiation than they emit terrestrial radiation, implying a net cooling of the surface? I’ve been puzzling over solar irradiance and thought you might be able to help. There was a 2010 paper by Haigh et al. showing a variability in solar spectrum irradiance that wasn’t predicted by existing models. Apparently, for a 3-yr period during the down slope of the most recent solar cycle, UV-range irradiance dropped much more steeply, and visible-range irradiance increased more dramatically, than expected. This got me thinking: if the sun is pretty much considered a black body, why would spectral irradiance change in any way not predicted by the black body spectrum? Or are such measured changes small enough to conform to the black body model? What are all the variables that determine such differential changes in spectral irradiance? This got me thinking: if the sun is pretty much considered a black body, why would spectral irradiance change in any way not predicted by the black body spectrum? While you can calculate the effective black body temperature of solar radiation, the sun itself is not a black body. It has structure and parts like the photosphere, chromosphere and corona. And even the apparent surface, the photosphere, isn’t at a uniform temperature. I would like to calculate the sun’s radiance in the 8-14 micron range both at ground level and TOA, is there a site to do that online? At TOA it is a pretty simple exercise. 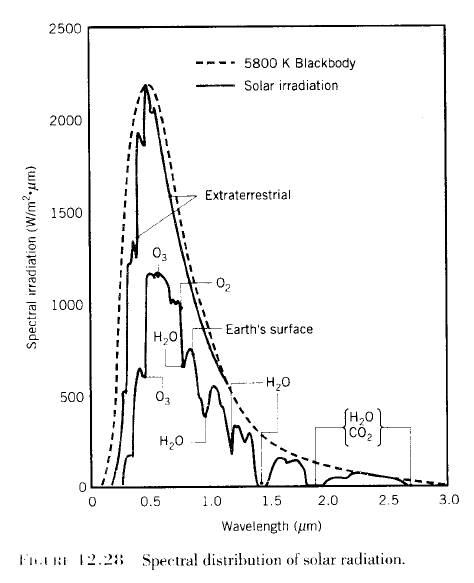 Although the radiation from the sun is not a perfect blackbody of 5780K, the spectral intensity is pretty close to that. So use the Planck formula for a blackbody of 5780K integrated across 8-14um, then use the inverse square law for the distance to the earth. (And of course there are lots of measurements of spectral intensity of solar radiation at TOA). If you are considering the angle of incidence then the value is multiplied by cos (angle of incidence). At the surface it is a much more difficult exercise. In fact, the proportion of solar radiation absorbed by the atmosphere is one of the atmospheric values with the most uncertainty, due to the sparcity of high quality groundstations and the variability in solar absorption/reflection from clouds, aerosols and the varying proportions of gases like ozone and water vapor. I would like to follow up my last question, as you pointed out calculating the radiation at the surface is more difficult, is there a reasonably priced instrument that can make this measurement. I have not found a radiometer specifically for this application but I am interested in one. It depends on your definition of reasonable. I doubt you could make the measurement you want without using a spectrophotometer. An FT-IR spectrophotometer configured to make high resolution emission measurements would be on the order of $50,000, I think. It would get more expensive to configure the device to measure direct normal solar radiation in that wavelength region. I suspect you would need a low pass interference filter to screen out UV, visible and near IR wavelengths like those used on pyrgeometers, among other things. what if the pyranometer is recording the value of 1450 w/m2.